It’s probably just me, but the idea of featuring a stir-fried vegetable dish with plain garlic oil seems uninteresting and somewhat boring. Plus, with my old point-and-shoot camera, I could never capture the beauty and freshness of my vegetable dishes–they always looked utterly unappetizing and appeared like some green blah. So here is my clarification: I eat my greens and am not cholesterol-overload despite my seafood obsession. Above is my stir-fried Brussels sprout with dried sole. Sole fillet is available fresh, frozen, and dried. Known as 扁鱼干 or Pee Hu in Hokkien dialect, dried sole is a great ingredient when it comes to vegetable stir-fry’s. The texture and taste of dried sole marry beautifully with crunchy vegetables such as Brussel sprouts. Stir-fried Brussels Sprout with Dried Sole recipe - The texture and taste of dried sole marry beautifully with crunchy vegetables such as Brussel sprouts.I can assure you that you won’t be disappointed. Heat up a small pot of water and bring it to boil. Add a few drops of cooking oil into the water (to preserve the color of the Brussels sprouts) and boil the Brussels sprouts for two minutes. Drain and set aside. Heat up the wok and add the cooking oil. Add the sliced garlic and do a quick stir. Add in the dried sole fillet pieces and stir fry until they turn golden brown and crispy. Add in the Brussels sprouts, oyster sauce, water and stir fry for 1 minute. Add the sesame oil, a dash of white pepper powder and a pinch of sugar. yums look simple and delish. :D i haven’t ever made brussel sprouts. Not familiar with that ‘pee hu’. At first thot those were ‘kiam hu’. Who says Belgium hasn’t much to be famous for? Brussel sprouts! I like Pee Hu too, not as saltish compared to Kiam Hu. Where you get yours from ? yeah… same here.. I do eat a lot of vege but don’t normally take pictures of them. They always turn out to be the green blah like you said. Your brussel sprouts do look very good though. btw, I am in south pasadena. I had a lot of brussels sprouts when I was studying in Leicester, England. Cheap and nutritious! By the way, the digital camera really does wonders to your food and presentation. Great pics! Brussel sprout is my fav! Crunchy and flavourful. 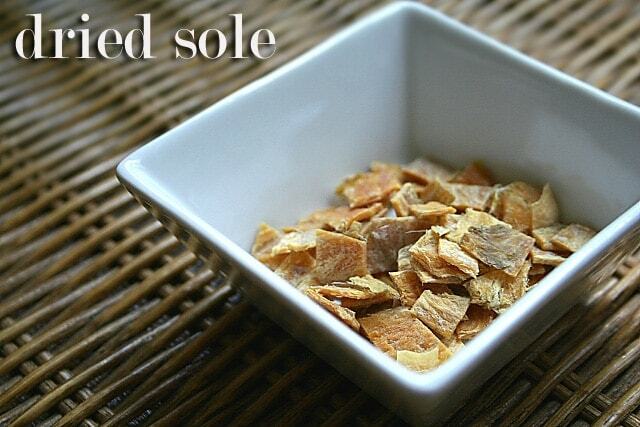 Is dried sole also called as ‘Chai Yu’? That new camera of yours! DAAAANG! Budding Cook – so when are you making yours. Tummythoz – I am sure you have had it before…it’s usually used during Chinese New Year for this dish stir-fried with bangkuang, etc. Stef – oooh, I want Belgian choc. Chubbypanda – yeah, I used them all up for my prawn noodle! PabloPabla – Now I know, anyone can take pretty decent pictures provided you have the right gear. When are you buying? wa more delicious slimming secrets from da Princess ! er… i don’t know what is dried sole… even with the hokkien name pee hu, i don’t know! (even with pictures!! crazy eh!). it look like what one usually use for economy fried mee/bee hoon, in hokkien something like this ‘teh ga kee’. HI Rasa Malaysia: The pictures of the brussels sprouts were really good. It’s so hard to get the character out of such things but you did it so marvelously. Care to share how you did it? The lighting seems much better now … was it natural light? TeamBSG – thanks for doing the economy rice post. I live in an Irish neighborhood so I eat a lot of brussels sprouts. But they tend to cook it to death, like diner broccoli. Your sauteed brussels sprouts looks nice and crunchy. Normally, they take out the core to reduce the bitterness. I notice you didn’t take the core out. Was it bitter? Oooh. I think this dried sole thinghy is what I had brought back from Singapore! I was wondering what is the Engligh name for it as I only know the name in Teochew! They are so yummy and can be added to soup too! I just used some of it for my stir-fried tao gei today. hi! RS.. I’m so gonna try cooking this. It’s gonna be my 1st attempt at brussels sprout. btw, i dig ur blog…so inspiring to budding cook like moi heheee.. I want to head out to my local Asian supermarket for some dried sole in a day or so to try out this dish. Where in the store is it? I have plenty of Chinese supermarkets around here so finding a place to shop wont be a problem, just wouldn’t know which aisle to look in. Does it actually say “Sole” on the package or will I need to bring a translator with me? stir-fried Brussels sprout with dried sole sounds like a good idea. 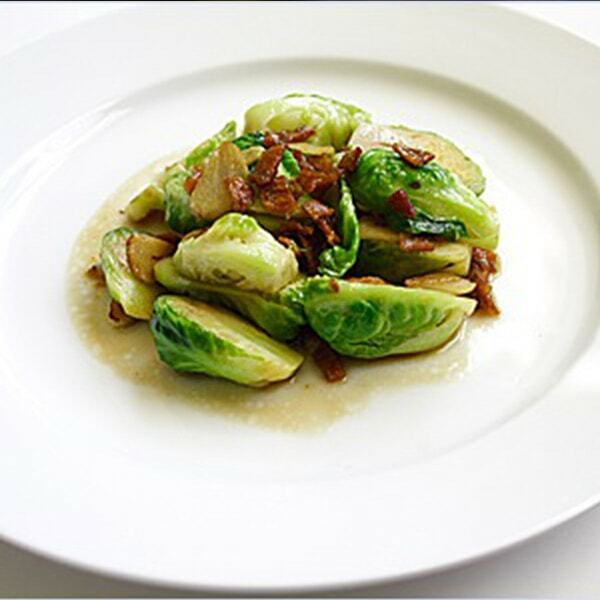 thank you for sharing stir-fried Brussels sprout with dried sole recipe. Yes – someone else who loves brussel sprouts! I love brussel sprouts, but for some reason my friends aren’t that into it. Your pictures look really tasty and I definitly will try your recipe. Personally, I love brussel sprouts and all green asian veggies cooked in chicken stock. It just tastes so so good! Your recipe is good. I usually use kiam hu for bean sprouts or kailan and they are good too. I have no doubt that pee hu will be good, but getting dried sole could be a problem, especially in NZ. Will definitely try it out once I get some pee hu. Thanks. Never knew how to cook brussel sprouts, so was glad to try this recipe. Yes it turned out great except the fried sole fish wasn’t crispy anymore,perhaps it was because I washed them under running water prior to cutting them up and frying.Could you please confirm that they are not supposed to be washed. Thank you for sharing this recipe. I tried out this dish. It delicious! 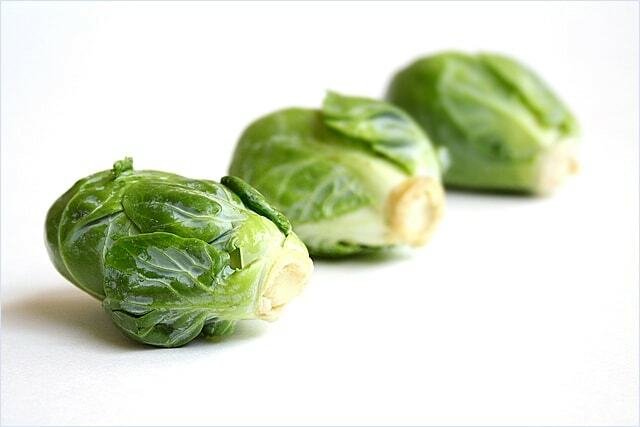 I like Brussels sprout but often find them too bland. My husband loves this dish. I didn’t use the dry version of the fish. I used bottle salted fish. They are soaked in oil in a bottle and the salted fish stays really fresh. Just as the recipe mentioned, the salted fish needs to be stir fry till it’s crispy and brown. It turns out so great that i’m including it in my recipe file and i suspect that i will be cooking brussel sprout more often now! I have also tried cooking brussel sprout (saw on a cooking show) using duck skin and olive oil and adding sausage/ham and apple into it. 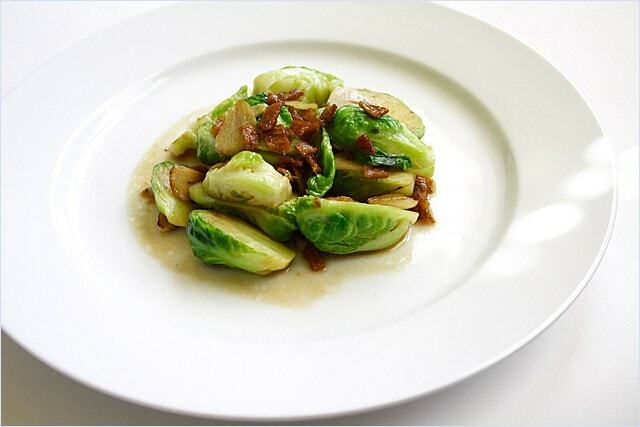 The sweetness from the apple and saltiness from the sausage complement very well with the Brussel sprout. However, your dish is so much simpler and tasty. Thank you very much for sharing.